According to Learn Liberty the term price gouging is defined as “raising prices on certain kinds of goods to an unfair or excessively high level during an emergency.” The phrase itself carries with it quite a pejorative connotation of extorting the consumer by gouging out his wallet. As with most economic fallacies this deception is exposed with a simple logical review of the circumstances surrounding its employment. The price mechanism, as with all other aspects of Free Market Capitalism, is intimately responsive to the oscillating nature of supply and demand. Constant feedback is necessary between entrepreneur and patron. This is why when “government” takes over a sector of society the result is always shortages, surpluses, and inevitable devastation. By its very artificial monopolistic nature, “government” completely bypasses and ignores the signals of supply/demand that determine the optimal price of a given product. These natural market forces are absolutely corrupted when “government” introduces violence into a previously peaceful equation. The signals of supply and demand regarding staples are no more exaggerated than during a natural disaster, national emergency, or in times of war. Human desires are infinite and resources are scarce. 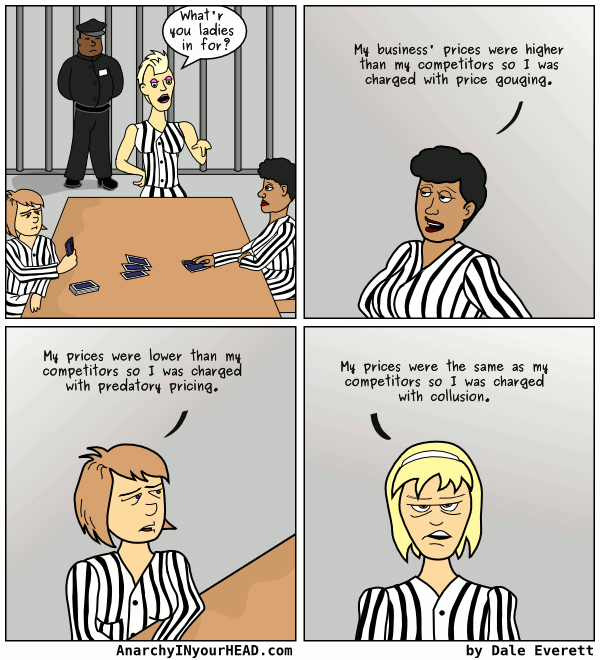 It follows that the pricing of items must closely reflect what the people want and the degree to which they want it. A finite item that is in low demand due to relative abundance or during peace time is comparably undesired by the people, therefore one will see lower prices to reflect this. 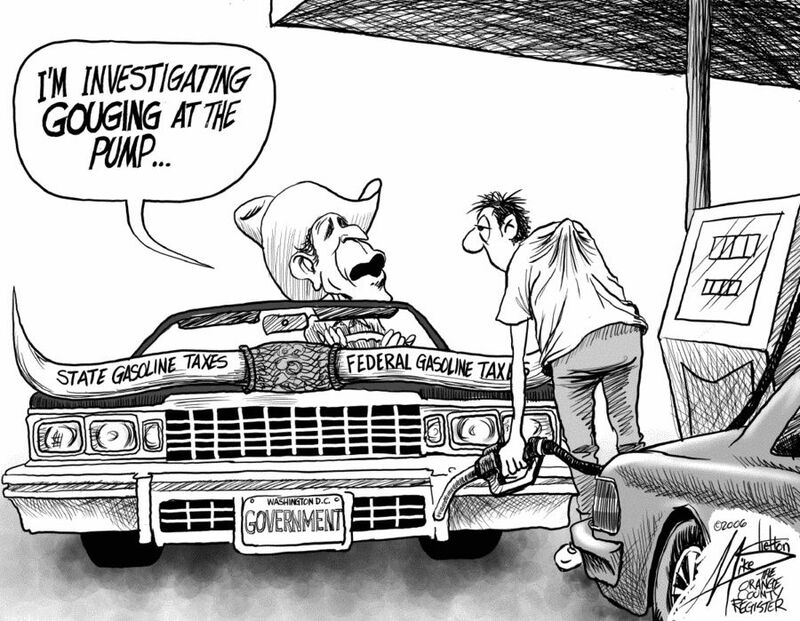 An example of this is gas prices during peace time yielding a low price in the market. A finite item that is in high demand due to relative scarcity or during times of hardship is comparably more desired by the people, therefore one will see higher prices to reflect this. An example of this is gas prices during warfare or after a natural disaster (hurricane, earthquake, tsunami, tornado etc). These higher prices are helpful for the conservation of scarce resources and for their allocation to those who truly need them and who are willing to pay the higher prices. 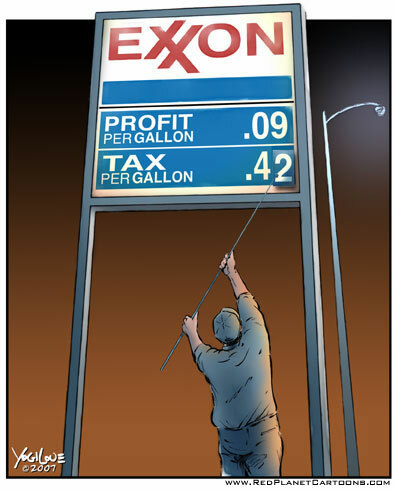 For example price controls on gasoline, as we had after Hurricane Sandy, only served to exhaust the supply to those who bought and hoarded as much gasoline as possible leaving the vast majority without. The result was long lines and disproportionate allocation of gasoline. Higher prices would have solved this as people would only have purchased what they truly needed. They would have been incentivized to conserve gasoline and consume less. Some people believe that prices are arbitrarily determined by greedy capitalist pigs who can charge whatever price they want and the public is forced to pay. This is a vast over-simplification of reality and of human behavior. Businesses do not exist in a vacuum. They are constantly subjected to the forces of competition as exerted by other businesses in their field and in other fields. This ensures that whatever price one business charges for a product, another business will seek to gain patronage by undercutting them with slightly lower prices or by offering a better quality product. This is true even in an emergency environment and will therefore guarantee that prices for a given item will not be arbitrarily determined by any single business. In a vain attempt to justify the existence of the self-licking ice cream cone that is “government” there currently are 34 states that have anti-price gouging laws that prohibit the natural raising of prices to reflect the rise in demand. End the strangulation of the small business owner and entrepreneur! Stop believing in the myth known as “government”! Free yourself from delusion and you will know prosperity! With various people complaining about “price gouging”… economist Walter Williams has coined a new term: “Tax gouging.” But government is never accused of either “greed” or “gouging” — not even when they bulldoze people’s homes in order to turn the land over to businesses that will pay more taxes.